Thanks to Roy’s article, what we can definitively determine is that PolitiFact rates speculation as fact or fiction. It isn’t possible to determine whether then-candidate Obama’s statement was true because the legislation hadn’t been written at that point. Without reading the legislation’s language, it’s impossible to tell whether Obama’s promise was true or false. That’s quite damning to PolitiFact’s reputation. The statements reviewed by FactCheck.org, by contrast, either note that something is speculative or they’re commenting on promises made by political candidates. Simply put, PolitiFact is more about playing political favorites than it’s about fact-checking politicians’ statements. That’s why I’ve never taken their statements that seriously. Admittedly, they got President Obama’s lie of the year right. Unfortunately, they didn’t get it right until 5 years after they rated that statement as true. That’s a pretty pathetic record. Sunday afternoon, the Minnesota Vikings defeated the Detroit Lions in the final game in Metrodome history. In a game that only meant something in terms of draft positioning and, possibly, the head coaches’ fate, Cordarrelle Patterson stole the show, scoring a pair of touchdowns. Patterson’s first touchdown came after he chose not to throw a wide receiver option pass, instead finding his way through the Detroit Lions’ defense for a 50-yard TD run. Patterson’s other touchdown was the game winner in the fourth quarter. It came on a back shoulder throw from Matt Cassel with just under 10 minutes left in the game. It was a fitting game for the Metrodome’s finale because the Metrodome wasn’t a great sporting venue. People have great memories of the Metrodome because of the events, not the facility. What’s memorable about today’s game was that Cordarrelle Patterson’s play today told defensive coordinators across the NFL that they’d better know where he’s at on every play. Simply put, he’s the bigger-and-faster version of Percy Harvin. That and he doesn’t have Percy’s migraines. Matt Asiata, who started in place of Adrian Peterson and Toby Gerhart, rushed for 115 yards on just 14 carries. Should Gerhart leave after the season as a free agent, Asiata seems like a more-than-adequate back-up for Adrian Peterson. Another bright spot for the Vikings was TE Chase Ford. Ford’s play might’ve pushed Litchfield’s John Carlson off the Vikings roster. Carlson has battled injuries throughout his career. He signed an expensive contract 2 years ago, coming from Seattle through free agency. The Vikings might just cut him and free up cap space to shore up other positions of need. Today was likely the last games in a Vikings uniform for Jared Allen, Kevin Williams, Erin Henderson, Charlie Johnson, Chris Cook, Toby Gerhart and possibly Eversen Griffin. Frazier will be fired as the Vikings’ head coach Monday, according to Jay Glazer of FOX Sports. Frazier is in his fourth year as the head man in Minnesota, after taking over on an interim basis in Week 11 in 2010. He led the Vikings to a 3-3 finish that season before receiving the job full time. That’s bittersweet news. In his 3 full seasons, Frazier’s records have been 5-10-1, 10-6 and 3-13. Winning 18 of 48 games means winning less than 40% of the games he coached. That said, though, razier’s players played hard most of the time. Unfortunately, NFL head coaches aren’t judged by whether they’re men of integrity or whether their players play hard. NFL head coaches are judged on wins and losses. That’s why the Metrodome’s finale was likely Leslie Frazier’s Vikings finale. I know we’ve asked a lot from you this year. Sign a petition. Share an email. Join us on Facebook. But I have one more critical ask. Thousands of progressives across Minnesota have donated to A Better Minnesota this year ($10 has been a common contribution), but we are just short of our goal for 2013. We need your help to push us across the finish line! Will you join your fellow progressives and donate $5, $10, or $25 right now? Whether it’s holding politicians’ feet to the fire or advocating for a positive, progressive vision for our state, there is no turning back on the work we’ve already begun. You are a part of our mission to fight for a better Minnesota. I sincerely hope that you’ve been impressed with what we’ve done so far. The truth is that we’ve done it all with your support. We don’t depend on others to fight for our progressive values. We depend on you. Please donate $5, $10, $25, or whatever amount you can today! First, I’m skeptical that there’s such a thing as a “positive, progressive vision” for Minnesota or any other state. The progressive agenda isn’t positive. It’s true that there’s a bunch of things that progressives want to do but that doesn’t justify characterizing that agenda as positive. Transit-oriented development (TOD) provides the opportunity to enhance the transit investment by shaping regional development around transit. The working definition of TOD, as defined by the Metropolitan Council and partners at regional think tanks in September 2012 and February 2013, is: A moderate to higher density district/corridor located within easy walking distance of a major transit stop that typically contains a mix of uses such as housing, jobs, restaurants, shops, services and entertainment. These districts/corridors enable people of all ages, backgrounds, and incomes abundant transportation choices and the opportunity to live convenient, affordable and active lives. This is another example of a “positive progressive agenda.” Just like the Affordable Care Act, aka Obamacare, isn’t about improving health care or extending health insurance to people who were uninsured, TOD is about controlling people’s lives. Simply put, so-called positive progressive politics is about controlling people’s lives by using government force to tell people what they have to do. While I recognize the fact that a progressive reading this will accuse me of writing an anti-government rant because conservatives hate government, that isn’t what this is at all. What I’m saying is that I want government to do what it’s supposed to do. Things like public safety and setting tax and regulatory policy isn’t done by the private sector. Put differently, I want government limited and useful but I want the private sector and individuals to make most of the important decisions for their families or their company. Like I said earlier, the progressives’ agenda is about controlling people’s lives. That’s why ABM’s ‘positive’ progressive agenda is destined for failure. ABM’s way is the controlling, deceitful way. It isn’t about giving people liberty or meaningful choices. At its finest, the GOP agenda is about letting families decide what’s best for them. ABM’s agenda is best described as convincing families it’s more important to do what’s right for the collective than for their families. In the months before Congress passed the president’s healthcare law, Sen. Mary L. Landrieu faced a deluge: The office phones rang off the hook, the mail was heavy and a few restive constituents, well aware of the cameras, showed up at her events urging her to vote against it. The three-term Louisiana Democrat was one of the final holdouts, but ultimately she backed the bill. And now in this red state, where President Obama lost by 18 percentage points in 2012, her opponents intend to make her pay the price. After reports surfaced of $100 million for Louisiana was added to the Senate’s health care reform legislation, originally from ABC News, and subsequently commented upon by prominent lefties, like U.S. News and World Report’s Bonnie Erbe as my colleague Noel Sheppard pointed out, Sen. Mary Landrieu, D-La., took the Senate floor on Nov. 21 to announce she would vote in favor to proceed forward with the Senate Democratic leadership’s bill. In other words, Sen. Landrieu was bribed into voting for the catastrophic disaster known as the ACA. She ignored her constituents while accepting a bribe to vote for legislation that didn’t fix the problems that President Obama promised it would fix. Sen. Landrieu’s third mistake is pretending to stand up against President Obama’s failed health care initiative. Sen. Landrieu’s history isn’t littered with profiles in DC courage, if such a thing even exists. She’s known as a dealmake in the worst sense of the word. At some point, compromise will be needed. She sat in the power seat and got a few trinkets in exchange for voting for the worst legislation in US history. No legislation has done more to expose people’s personal information to indentity thieves. No legislation has done more to tell the average American family that the product they’ve purchased is substandard when, in reality, these “substandard” policies have saved their lives. The sanctimoniousness and I-know-better-than-you attitude drip from those sentences. For that and other reasons, Sen. Landrieu isn’t worthy of the high office of United States senator. She put her good standing in the Democratic Party ahead of her constituents’ needs. In the end, that’s the most damning reason why she needs to be fired next November. The second thing Collins emphasizes is the most effective CEO is not a celebrity. If the boss is a celebrity, then you have “one genius and 1,000 helpers.” He talks about CEOs who tell the media they are going to produce the best products, be the best grocery chain, university, football team, etc. Yet, successful companies build their businesses with practical, achievable goals and little fanfare. I call this accountability. Part of my training to be a supervisor was a class called Interaction Management. One of the things that IM emphasized was identifying key principles. These key principles could be anything from getting a simple job done that takes little time to empowering workers to master a multi-faceted responsibility that might take 3-4 hours. At Fingerhut then, the key to accomplishing important responsibilities wasn’t about instructing the employee what he or she needed to do. It was about telling them about their responsibilities to their co-workers and their employer. How they got from Point A to Point B wasn’t important as long as the thing got done properly and in the fastest time possible. A successful team develops a positive, can-do spirit, toughness and, most importantly, trust and a sharing of the joy of success. Ronald Reagan once said that “It’s amazing what you can accomplish when you don’t care who gets the credit.” Of all of the wise things Ronald Reagan said, that sentence was consistently proven true. It’s something that others have picked up on. Superblogger Glenn Reynolds wrote a book a few years back. Appropriately, it was titled “An Army of Davids.” The key principle that Reynolds conveyed to his audience was that there were hundreds of experts just waiting to be discovered and utilized through the internet. He didn’t think that everyone on the internet was a genius. It’s just that he thought that he knew that, for every highly-publicized expert on TV, there were hundreds of experts on the internet just waiting to be found. Reynolds’ attitude wouldn’t be possible if he was an egomaniac. Successful people have to have an ego because they couldn’t survive without it. The difference between successful people and and egomaniac is that egomaniacs are control freaks. They’re the fastest people to the microphone when there’s success. They’re also the people you won’t see admitting failure. Reynolds couldn’t have written that book if he was a control freak because he needed to admit that there were lots of outstanding people in every discipline in the United States. Thanks to his book, lots of people were empowered. Today’s Vikings-Cincinnati game wasn’t as much a contest as it was a pummeling. Cincinnati looked like a formidable team capable of making a strong playoff push from the start. Meanwhile, the Vikings looked like a team that can’t wait for the Leslie Frazier era, and the season, to be over. If there was any doubt that the Vikings need a major overhaul this offseason, this game put that question to rest almost instantly. On the game’s first series, Matt Cassel fumbled. Cincinnati returned the fumble to the Vikings 4 yard line, where the Bengals scored 2 plays later. Cassel is the best of the Vikings QBs, which says everything about the state of the Vikings’ QB situation. Of the impending free agents on the defensive line, only Eversen Griffin is worth bringing back. Jared Allen will want too much for the production he’s got left. KWill has been a stud but he’s getting to the end of his career. Letroy Guion and Fred Evans never were productive players. That’s why it was a gift to have Sharif Floyd drop into the Vikings’ lap last year. Of the linebackers, Chad Greenway is the only player on the roster who’s worth bringing back. Erratic is the kindest adjective for Erin Henderson’s play this year. Worthless might be the most accurate adjective for Henderson’s play. In the secondary, you’ve got 2 players you can absolutely build around. Safety Harrison Smith is someone to build around, as is corner Xavier Rhodes. Josh Robinson needs to be moved outside, which is his natural position. He clearly isn’t a fit as the nickel. He’s fast, athletic and young. It’s too early to give up on a player like that. As far as who should be the Vikings next coach, Paul Charchian threw out a name during the Vikings’ Postgame Show on Fox9 that I think is worth looking into: Ken Whisenhunt. He’s coached on 2 Super Bowl teams, which is amazing considering one of those teams was the Arizona Cardinals. Prior to the Whisenhunt era, I’d argue that the Cardinals were the Chicago Cubs of the NFL. The Bidwill family was the cheapest family in the NFL by far. The joke at league meetings was that the way to make copper wire was to try pulling a penny from Bill Bidwill’s fingers. Despite the Bidwills’ cheapskate ways, Whisenhunt won. The first thing he did in Arizona was resurrect Kurt Warner’s career. After getting fired in Arizona, San Diego hired him. Now Philip Rivers’ once-dead career is showing signs again. If you want to strengthen the Vikings quickly, one way is to trade a third-round pick to the Redskins in exchange for Kirk Cousins. The Vikings have Seattle’s third rounder so they can afford trading one of their picks. With Cousins in place to become the Vikings’ QB, the Vikings could then use their first round pick to get a linebacker like UCLA’s Anthony Barr or a dominant NT like Notre Dame’s Louis Nix. At least the Vikings will have started rebuilding 2 defensive units that badly need rebuilding. The Vikings should keep Rick Spielman as GM, though. It’s true that he drafted Christian Ponder, which is a strike against him. That being said, he also drafted Adrian Peterson, Matt Kalil, Harrison Smith, Sharif Floyd, Xavier Rhodes, Cordarrelle Patterson, Kyle Rudolph and DEs Eversen Griffen and Brian Robison. He’s also drafted Pro Bowl placekicker Blair Walsh and punter Jeff Locke. In short, he’s done more than enough to earn his return. The Vikings offseason unofficially started today. The coaching staff shouldn’t return, with the exception of George Stewart. Rick Spielman and the scouts need another strong draft to turn this team around. For his part, Andy Brehm nailed it by saying that this is Campaign 101, that everyone who’s ever been involved in a campaign knows that it’s illegal for candidates to coordinate their efforts with outside expenditure organizations, PACs or with a party’s campaign committee. When it was Ember Reichgott-Junge’s turn, she said that “campaign finance laws are too complicated” before launching into the rules governing independent expenditure organizations, superPACs and other special interest efforts. Saying it was a wimpy, insulting answer is understatement. While there’s many rules and regulations about reporting requirements, transparency requirements and other considerations, that’s irrelevant to this discussion. The only thing that’s relevant to this discussion is that DFL campaign committees knowingly violated campaign finance law by coordinating advertising with a dozen DFL state senatorial campaigns. What’s also insulting about Reichgott-Junge’s statement is that it played into the ruling that the DFL campaign committees didn’t admit to wrongdoing. Like I wrote earlier, they didn’t need to. What they did has been illegal since Watergate. Reichgott-Junge knows this. She’s run for election. She can draw on her own experience. She knows that the DFL was willing to do anything, legal or illegal, to have a DFL governor and DFL majorities in the House and Senate. They’re perfectly happy paying this fine. That’s a tiny price for ramming the entire DFL special interest wish list down Minnesota’s throats. Does anyone think Tom Bakk lost sleep over this? Is it more likely that he laughed when he heard the ruling? Is SCSU a great place to work? Drs. Kircher and Stilwell were targets of a hostile work environment at St Cloud State University and as a result were denied tenure. This is their terminal year. Drs. Kircher and Stilwell made several attempts to change the overall hostile work environment and to bring equity and equality to their department. Drs. Kircher and Stilwell are considered to be whistle blowers and troublemakers. The facts document clear retaliation by the social work department and the university. The union did not adequately protect them. This petition will be sent to the Minnesota State Colleges and Universities, St. Cloud State University, and the Inter faculty Organization. We, the undersigned, call on MnScu and SCSU to reverse their decision about Drs. Kircher and Stilwell’s tenure and promotion and to rectify the hostile work environment in the social work department. Lots of SCSU employees have already signed the petition. I’ve talked with these professors. They’re understating things when they say that they worked in a hostile work environment. It took a ton of bravery for them to take this step because of the hostile work environment they dealt with. Based on what I’ve been told by other professors, tenured professors, I might add, that these ladies did the work to earn tenure. The petition said that they “are considered whistle blowers” as though that’s a strike against them. It isn’t. They blew the whistle when they saw wrongdoing. In the America that still has integrity, that’s called doing the right thing. In the America that asks ‘what’s in it for me’, that’s supposedly a bad thing. What’s most disgusting is the fact that the provost’s letters denying these professors tenure were form letters, complete with identical spelling mistakes. The letters didn’t say why they weren’t given tenure. They weren’t even told what they needed to do to get tenure. At the October 9th Meet & Confer, Holly Schoenherr announced that SCSU had signed a contract with the Great Place to Work Institute, which cost the University an estimated $50,000. I say estimated because the administration has used multiple figures. Regardless, it’s apparent that the Great Place to Work logo only applies to their PR strategy. It’s meaningless from a substantive standpoint. These professors are living proof of that. SCSU’s enrollment reached a peak of 18,611 in the Fall of 2010 and has declined significantly the past three years. 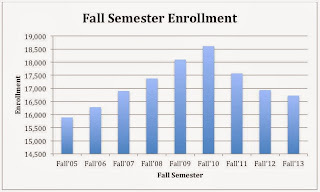 Based on the data on the MnSCU website as of December 19, 2013, the enrollment for Fall 2013 is down 210 students compared with Fall 2012. This translates into a decline of 1.24%. Even the St. Cloud Times reported this as ‘good news’ because the administration had projected a 5% decline. Based on the plot and a decline of only 1.24% for Fall 2013 you might think that enrollment at SCSU is bottoming out and things are going to be just fine given a little time. You’d be wrong in making that assumption! The Minnesota Legislature created the Post-Secondary Enrollment Option (PSEO) program in 1985, which allows juniors and seniors still in high school to earn college credit. 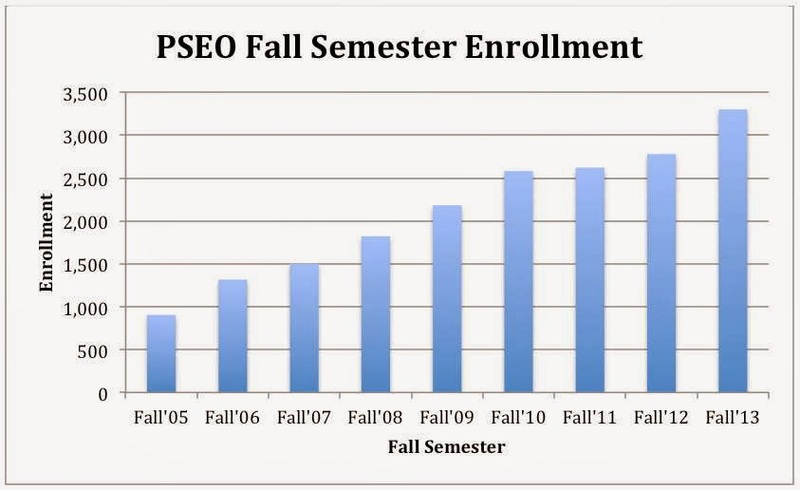 The following plot shows the fall enrollment of PSEO students at SCSU from Fall 2005 through Fall 2013. 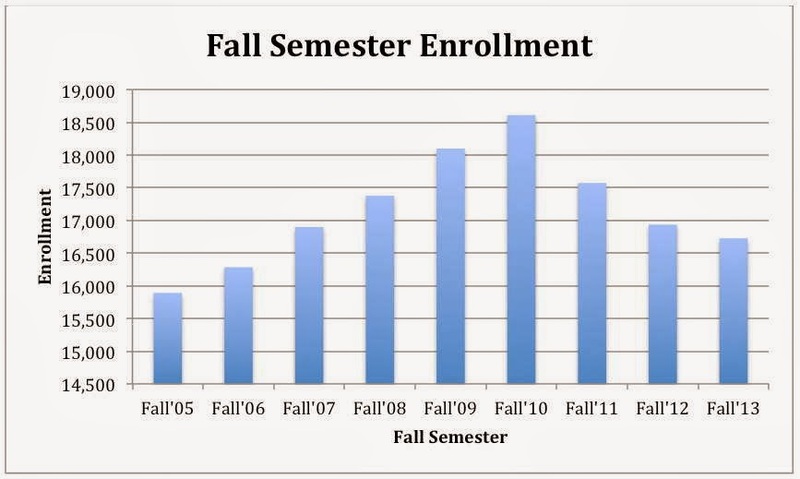 As illustrated in the figure, the enrollment growth since the Fall of 2005 has been amazing! John Bergeson, Dean of the Center for Continuing Studies is nothing less than a miracle worker. 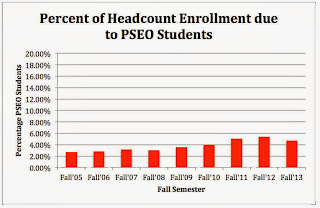 Under his leadership, enrollment in PSEO for high school students has grown a total of 265% over this time period. However, if you take a look the total enrollment shown in the first figure and then subtract the PSEO enrollment in the second figure, you get a very different picture of St. Cloud State’s enrollment. When you compare this plot with the one shown in the first figure, this plot shows that the vast majority of the growth in the enrollment from Fall 2005 through Fall 2010 was due to the growth of the PSEO enrollment and the rate of decline in enrollment for Fall 2011 through Fall 2013 has been masked by the significant growth in PSEO enrollment. 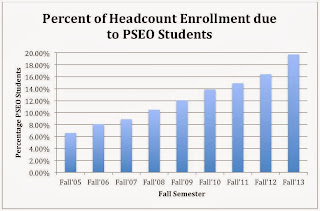 These effects can easily be shown by calculating the percentage of the total enrollment due to PSEO students. 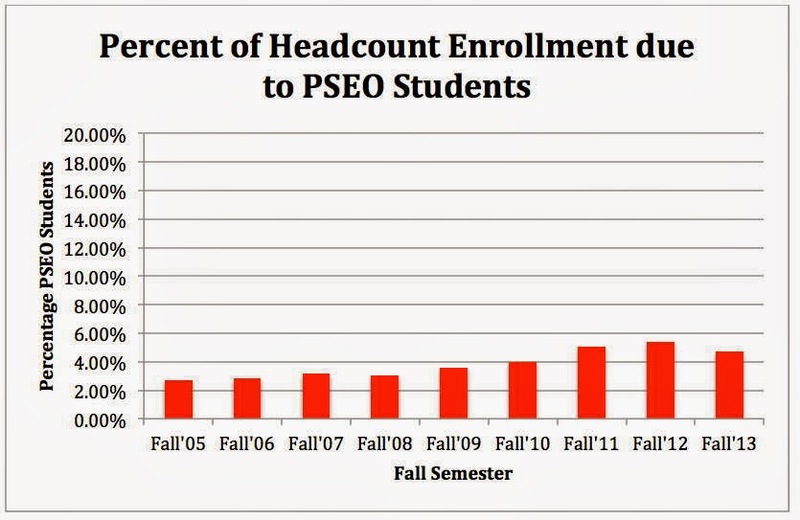 In Fall 2005, PSEO enrollment accounted for 6.59% of the total enrollment. 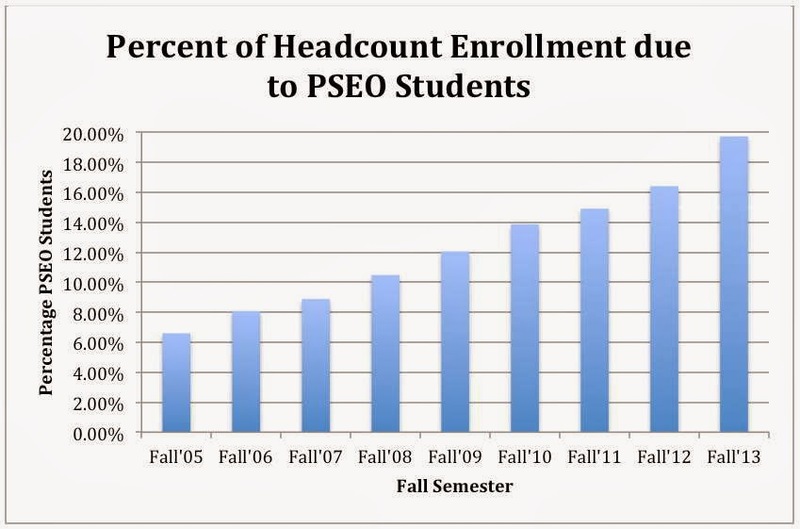 For Fall 2013, the percentage of the enrollment due to PSEO students has grown to an amazing 19.7%. I would be willing to just about bet anything that very few people on campus actually know that the percentage of headcount due to PSEO students is approaching 20% or one in five students! 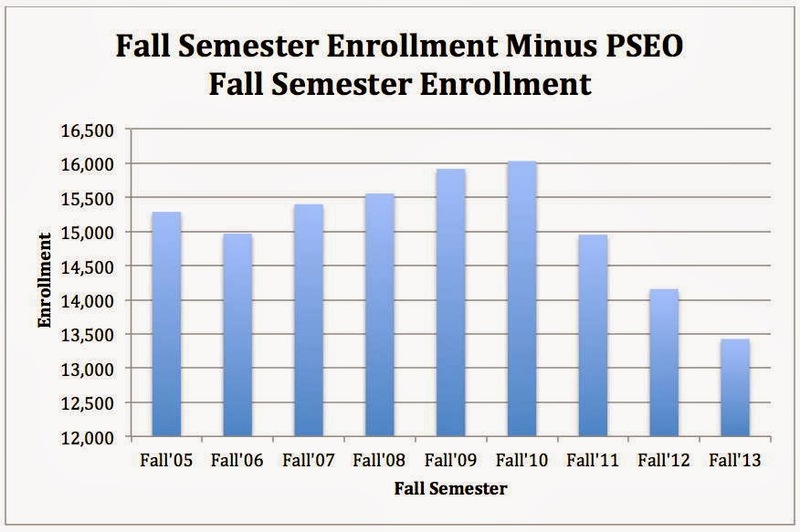 Clearly, the percentage enrollment due to PSEO students is much smaller at MSU—Mankato and while generally increasing the rate of increase is much smaller than at SCSU. 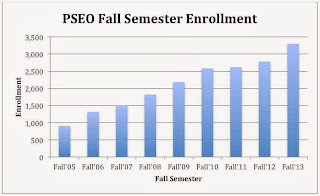 From MnSCU data for Fall 2013, the percentage of the enrollment at MSU—Mankato due to PSEO students is 4.71% compared to SCSU’s 19.7%. In looking at enrollment, there are two different numbers to consider: Headcount and Full Year Equivalent (FYE). Headcount (often just called enrollment) simply counts each different student who is enrolled. FYE enrollment is the total number of credits generated divided by 30 for undergraduate students and 20 for graduate students. Because part-time students are only taking one or two courses, headcount is always significantly larger than the FYE numbers. Since part-time students can significantly distort the enrollment number’s impact on the revenue side of a university’s budget, MnSCU bases a university’s base budget on FYE rather than headcount. Guess how post secondary enrollment students impact enrollment? If you guessed they increase headcount and only slightly increase FYE, you would be correct. 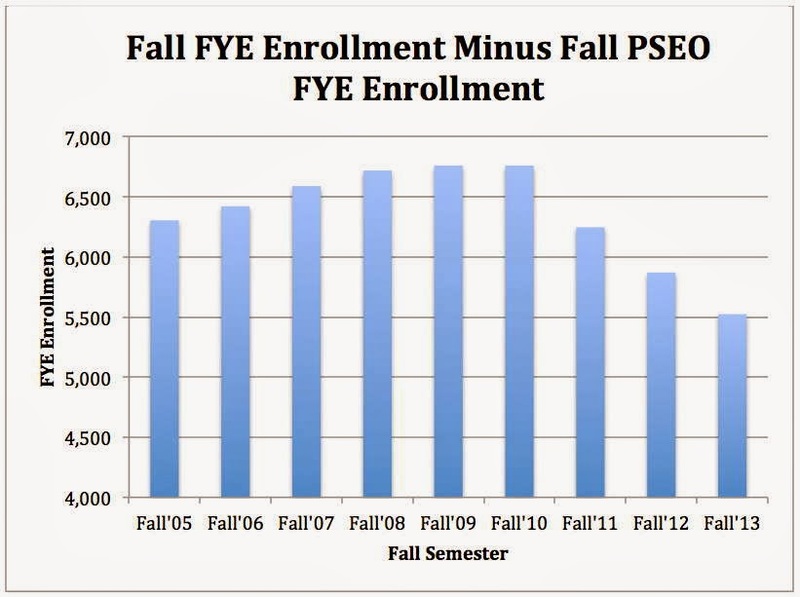 At SCSU in the Fall of 2013, PSEO students are taking an average of 5.1 credits so each PSEO student is equivalent to about 1/6th of an FYE. So, if you want to make enrollment look larger, you talk about headcount. However, remember budgets are based on FYE so headcount is really just a ‘feel good’ statistic. Headcount is also easier to understand and easier to report but when it comes to determining the budget impact of enrollment easier is not better! If you really want to see a true picture of the enrollment’s impact on the financial health of a university, take a look at FYE enrollments. If you want to see the financial impact of PSEO you can take the FYE enrollment for SCSU and subtract the FYE for PSEO. 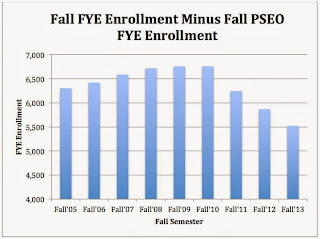 Clearly, without the FYE added from the PSEO students, the FYE Enrollment at SCSU falls from a peak of 6,760 FYE in Fall 2010 to 5,523 FYE in Fall 2013, which corresponds to a drop of 1,237 FYE or a drop of 18.30% over 3 years. 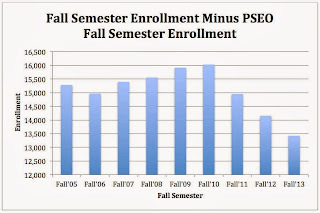 So without the PSEO students, our enrollment would look much worse than it is! However, accounting for PSEO students is not only important when looking the mix of students attending SCSU, it is probably more import when considering the revenue and expense impact of PSEO on the university’s budget. There is a small addition to the revenue budget that result from a state appropriation that is loosely tied to FYE enrollments. The impact on tuition revenue is much more dramatic since the PSEO students do not pay tuition. A quick back of the envelope calculation using the Senior to Sophomore (S2S) contract revenue total for the Fall of 2013 and dividing by the number of credits taken by S2S students this fall shows an estimate of revenue per credit that is about 1/3 of the full tuition normally charged. Unfortunately, it is not possible to have an exact calculation because the administration has never provided a balance sheet for the PSEO program. So back to Dean Burgeson. Give him a pay raise because without the headcount and small revenue the PSEO program raises, SCSU’s headcount would be significantly smaller and lower in revenue production. However, let’s think about it for a minute. Without considering the expenses of delivery of programs like S2S, it is impossible to know if the net effect of Dean Burgeson’s work is a positive or a negative. It is entirely possible that SCSU’s costs for delivery of S2S exceed the revenue produced. If that is the case another kind of distortion occurs and SCSU’s financial health as gauged simply by enrollment may be significantly flawed. In addition to finding answers to some of the financial questions, perhaps pedagogical questions also need asking. Who is really teaching the Senior to Sophomore students? While for each class there is a faculty mentor at SCSU, the classroom teaching is done at the high school by the high school teacher. Was the rapid expansion of PSEO at SCSU intended? Are adequate safeguards in place to insure the quality of the experience high school students receive worth of college credit? Finally, what will be the long-term impact on SCSU and the greater St. Cloud community if nearly 20% of the students included as attending SCSU never come to St. Cloud? Thursday, December 19, Plymouth, Minn. — Saying that they’ve completely failed to provide any oversight of Minnesota’s deeply troubled health insurance exchange, Republican gubernatorial candidate Jeff Johnson today called for the resignations of the two co-chairs of the MNsure Legislative Oversight Committee—Rep. Joe Atkins (DFL-Inver Grove Heights) and Sen. Tony Lourey (DFL-Kerrick). In addition to calling for Atkins and Lourey to resign from the oversight committee, Johnson also called for their replacements to be bipartisan—with one co-chair appointed by DFL legislative leaders and the other appointed by Republican legislative leaders. The co-chairs need to be one Republican, one Democrat because Democrats have refused to hold oversight hearings to protect Gov. Dayton, former globetrotter April Todd-Malmlov and the Democrats who voted for MNsure-enabling legislation. At the Sept. 24th meeting, the last meeting held by the committee, Sen. Sean Nienow demanded answers to his questions about website security. He got his answers less than 36 hours before Malmlov’s resignation this week. Clearly, Sen. Lourey and Rep. Atkins did everything possible run interference for Malmlov and the exchange. The public’s distrust is justified by the chair’s actions. Commissioner Johnson’s recommendation that the chairs be bipartisan should’ve been adopted from the start. Having the people who wrote the legislation chair the oversight committee offers too great an opportunity for them to hide the exchange’s problems. Now that the Democrats have earned our distrust, it’s time to do things right. If the DFL won’t provide oversight, the GOP will be the adults in the room and ask the tough, legitimate questions.